The dank corridors of fantasy dungeons can get a bit chilly, so this zip-up hoodie will keep you warm during adventures if you’re lacking a wizard with the ability to conjure fire. 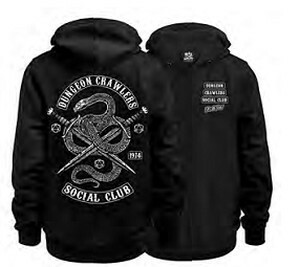 Not to mention it’s also pretty stylish, with a snake, daggers and d20 design on the back and the pithy catchphrase ‘It’s the pits!’ on the front. Why not buy one each for every member of your roleplaying group and get their names emblazoned on the front like a real club? 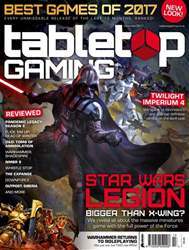 In December’s issue of Tabletop Gaming we have an exciting first look at massive miniatures game Star Wars: Legion, as its designers tell us about recreating the battles of the original trilogy on the tabletop. As 2017 draws to a close, we’ve rounded up the 10 very best games of the year . We’ve also asked some of the biggest designers from around the world of gaming to chip in with their own picks for 2017. The sci-fi excitement continues with a close look at the return of legendary strategy epic Twilight Imperium. We chat with the game’s original creator and the designers who inherited its legacy to find out what’s new in fourth edition. Plus, we give our definitive verdict in the reviews section! If you want even MORE sci-fi, we reveal how phenomenal series The Expanse went from the tabletop to TV and back again. If fantasy’s more your style, we’ve spoken with the studio behind not just one, but two, upcoming roleplaying games based on the Warhammer universe. Cubicle 7 explains how Fantasy Roleplay and Age of Sigmar are shaping up to be something special indeed. Still hungry for more? Allow us to satisfy your appetite with an in-depth look at how Euro masterpiece Food Chain Magnate was made, with a little help from the founders of renowned studio Splotter. Speaking of renowned designers, the creator of World War II classic Axis & Allies is back with his biggest wargame simulation yet – Larry Harris tells us all about his plans for War Room. Of course, we haven’t ignored the fact that Christmas is fast approaching. This issue’s 10 of the Best list is a special Christmas gaming gift guide, so you can find the perfect tabletop-themed prezzie for the special people in your life (or just yourself – after all, you’re special too!). That’s just the beginning of what’s in store inside our first monthly issue – dive in!